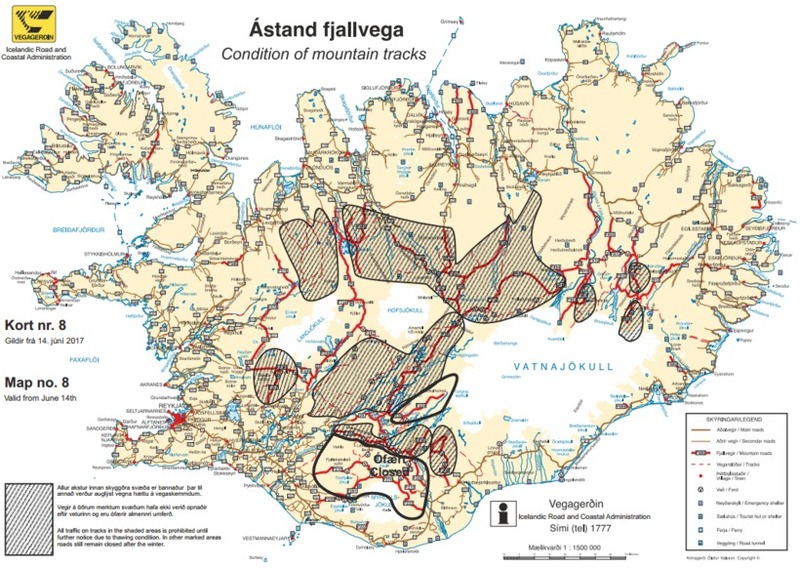 Most of the mountain tracks over the Icelandic highlands are only open during the summer months. When they open depends on the weather. The spring weather has been good in Iceland this year, so the tracks are opening relatively early. The road to Lake Öskuvatn usually opens late, 11 July last year, but it opened on 10 June this year. Many of the most popular highland roads have now been opened, but not nearly all. The roads that are open are Kjalvegur, (F35), Kaldidalur (F550), Arnarvatnsheiði (F578), Öskjuvegur (F88) and up to Öskjuvatn (F894), Kverkfjöll (F902) to Sænautasel and from Askja to Kárahnjúkar (part of F910). Tracks fjallabaksleið and Sprengisandsleið are still closed. This is not a complete list. You can see a map of which roads are open here.